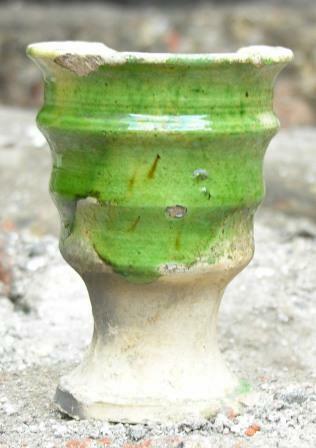 Ongoing excavations of the site of The Theater, the 16th century London playhouse where Shakespeare first performed as an actor with The Lord Chamberlain’s Men company of players and later debuted some of his most famous plays, have revealed an intemperate number of drinking vessels. Authorities at the time described The Theater as a “school for all wickedness and vice” so it’s not surprisingly that audiences were well lubricated. There was even a riot on the premises that required the police investigation in 1580. Archaeologists from the Museum of London also found the remains of the porcelain piggy banks (not actually shaped like piggies) which held the theater’s earnings until they were pooled together for division of the spoils among the company. Other playhouses were regarded by London authorities as “an offence to the godly” and a “hindrance to the Gospel”. The playhouses were well known for “unchaste matters, lascivious devices and other lewd and ungodly practices”. Theatre-goers were seen as “the worst sort” of “evil and disordered people” who skipped work “to mis-spend their time”. Excavations at New Inn Yard, Shoreditch, are building up that picture. 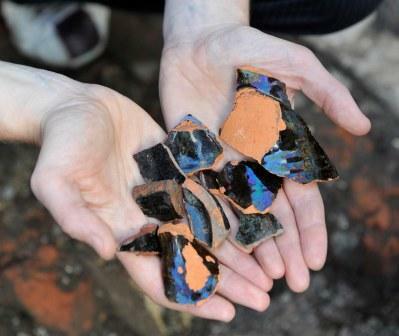 Archaeologists have unearthed scores of fragments of mid- to late 16th century wine and ale flagons and mugs – found in what was probably the playhouse’s bar area. Disorderly behaviour, doubtless often partly fuelled by alcohol – was one of the reasons the authorities disliked the establishment. The rabble liked the establishment just fine, obviously, and no wonder. Historians believe The Theatre was where Shakespeare’s Romeo and Juliet premiered, and if not the first stage to see A Midsummer Night’s Dream, The Merchant of Venice and Love’s Labour’s Lost, it was among the first. Interestingly, The Theater’s drunken audience may have in part been owing to the site’s previous use as a monastery. The remains of St John the Baptist Priory, a large and prosperous monastery founded in the 12th century then shut down during Henry VIII’s dissolution of monasteries in 1539, have been found along with the The Theater remains. Museum of London archaeologists suspect Burbage actually used the alehouse, re-purposing it as a tap house attached to the theater. Later imitators like The Globe and The Rose had in-house pubs, and we know the alehouse was still being used as such after the monastery was shut down, so it makes sense that The Theater might have taken advantage of the sweet location to start a trend. The only remains of the theater’s structure that have been found thus far are an inner wall, a fragment of the outer wall, and the compacted gravel courtyard which is where the general audiences would have stood. The wooden superstructure never had a chance to survive intact. Burbage’s sons dismantled it in 1598 (without the property owner’s knowledge) and used the wood to the build The Globe theater where Shakespeare’s players moved. That ill-gotten timber burned down with the first Globe 14 years after its illicit recycling.